Start of Week 8 running accountability post. So in my last accountability post I was telling you about how Mrs P talked me into signing up for a 10k race with bells, whistles and jingles on: the Banchory Beast. Described as “a 10k obstacle race in Aberdeenshire over rough muddy terrain, dirt tracks and forest. It has over 20 mega obstacles on route”. It’s graded as ‘fairly tough’. We are beginner joggers. It’s in 6 months. How? Why? Well, Mrs P does like a challenge, and I’ve got the breaking strain of a warmed-up Kitkat on a sunny day in the desert, so am easily persuaded. So we joined a team of much-fitter friends and paid up. Nothing like parting with hard cash to focus your mind on getting out the door for a run 3 times a week, eh? And yes, we started from not being able to jog longer than between 2 lamp-posts, and in 6 months time we’re going to be running one hell of a long, tough obstacle race. What’s the plan, Stan? Well, we’re going to continue with the twice-weekly JogScotland runs for 3 more weeks until the 10 week course is up. Then we’ll swap one of those runs for a local parkrun course that we heard has a beast of a hill in it. And once a week run with the Intermediates in our JogScotland group. We’ll continue our once a week solo runs and work on things like distance and speed through interval training and other things that Professor Google and JogScotland recommend. Or we think up. And training for obstacles? Well, we’ll get the running sorted first, I think, but general MuTu for continuing to strengthening our core muscles in the meantime. More on that in the next accountability post. I shall come up with a cunning plan. To keep us fully-focused on our 6 months of training, Mrs P found a shorter, entry-level mud fun run to do very soon: the Rebel Dubbit Dash It’s got mud, obstacles, tough terrain, and is only (‘only’!) 5km. However, as sharp-eyed Mrs P spotted, your entry-fee also gets you a bottle of free beer at the finish line. I tell you, you were shang-haiing people to form a team with us! So we’re going to be doing that in April. At the moment, my goal is to become fit enough not to die on the Beast or Dash course. Let’s check that objective: is it specific? Measurable? Achievable? Realistic and relevant? Timely? All ticks. Great! And the sub-goal is to get fit enough to actually enjoy them. What’s not to love about slithering around in mud with your pals?! So: how is training getting on? How much progress have we made this fortnight towards our goals? Well, I had a wee setback and had to miss a run (and cancel some teaching I was really looking forward to!) when I thought I was coming down with another cold. I normally get one cold a year, so to have 2 within the space of 3 weeks is just not on. When the cold kind of lingered, but didn’t become anything more than mild, I analysed a bit harder. It coincided with me choking on some cake (I know, I know, I’m sure you can’t believe that of me. Ahem). And actually, 3 weeks previously I’d choked on some of my dinner then had 5 or 6 days of sore chest, coughing, congestion, runny nose too. Oh… To cut a long story short, I’ve now added to my training plan: “Stop snorting your cake”. Winner. ‘You’re a quitter’ – 7 unbroken weeks and 50 mins solid running say that’s not true. ‘You can’t run’ – see the above. ‘You’re so slow’ – partially true for a short while longer. But I can sprint at 16kph and my average pace is increasing every single week. ‘You can’t do it’ – I am. Talking of hi-vis, the other big development for me this fortnight is stopping feeling quite so self-conscious about running. Yes, wouldn’t it be wonderful if I could suddenly look like I’m a runner first, before running? As in: having lithe toned legs, fewer chins, cheeks that don’t switch to ‘beacon’ for the rest of the day after the first km? It took a bit for me to properly accept that runners don’t look like runners; they look like people. If you move along the planet’s surface with both feet off the ground at once, you’re a runner (or a crazy, mixed-up jumper, but that’s another story for another time). It takes me a long time to see very obvious things, sometimes. In that spirit of just getting on with it, I’ve added to my night-running lights. 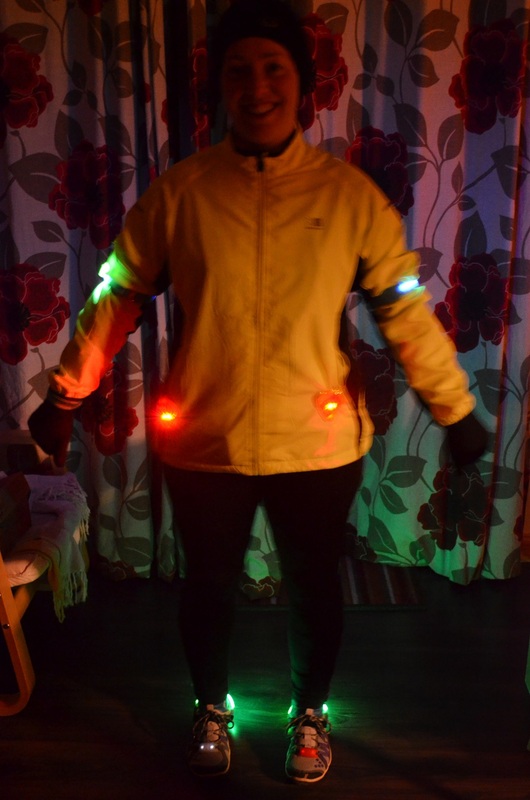 I’ve been using the minxes’ shoelace lights that flash with every movement, a headtorch around my wrist, and 2 flashing red clip-on lights on a hi-vis vest. My MIL sent me a wonderful surprise: a proper, real, runner’s hi-vis jacket! 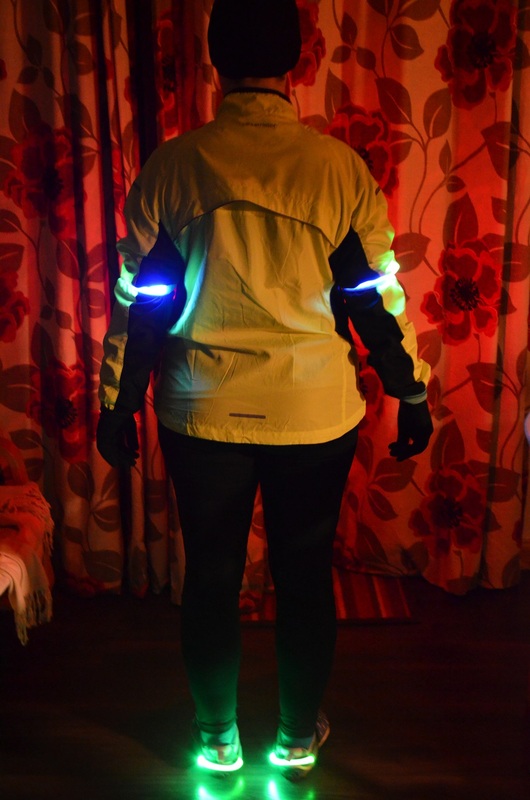 To that, I also treated myself to a pair of trainers heel lights and a pair of armband lights (£10 for all 4). I tell you, there are aircraft leaving the Aberdeen Approach paths and setting up their landing patterns on me! But the way I see it, if I fall over into a ditch with only my feet sticking out, I’ll still be seen. My fellow runners sing “O Christmas Tree” as they pass me, but I don’t mind. I don’t care that I’m danger of having ‘All the Gear and No Idea’ because that’s slowly coming together. And finally, talking of my MIL, she and FIL were visiting recently. She’s known me a very long time and so the running was a bit of a surprise to her, too. Rather than just raise an eyebrow and let me get on with it, as the rest of my family discreetly are, she eyeballed me and told me how much she admired me and was proud of me. What a lovely, sweet thing to say! I was and am really touched. There’s just something about getting praise from your mother / mother in law that top trumps all other possible praise. I’ve tucked that away in my Motivational Memory Banks for long-term keeping. Oh aye, and finally-finally, with us running over 5km 3 times a week without stopping by Week 7, I think it’s safe to say that we’ve done better and faster than the (brilliant) Couch to 5k plan that I originally thought was beyond me. Big thumbs up! Let’s see what the next fortnight has in store. One of the things that’s been motivating me out the door each time is seeing clear, obvious improvements every single run. To be fair, when you start at the rock bottom of Extreme Sport Biffdom, you’re always going to see an improvement at first! First it was accomplishing moving for any sustained length of time. Then it was seeing ourselves get faster and jog for longer. Finally being able to complete 6km at a jog/walk faster than I can fast-walk it was a big milestone for me! As was running in the rain and a few degrees below 0degC for the first time. On our last run together, we blasted through all of our fastest times for everything with each km run. Tonight, I’m determined to run the entire way up a particular nemesis hill without stopping again, to show it wasn’t a fluke last week. Over 5 weeks and 72km total run, my time for moving over 5km is now 40 mins 31 seconds. My fastest time over a km is now 7m 25; fastest over a mile has been 12m 12. Not wonderful times I know, but I’m very proud of this progress, and I’m looking forward to the next month. I still can’t believe that I actually feel this way! This leads me to something that puzzled us briefly this past month. My friend is also doing MuTu to help her strengthen her core, so we frequently compare notes on how our bodies are getting stronger (or not: those sore legs from my idiotic session hurt for 5 days). My friend mentioned she’d put on 2lb. We agreed that it was unlikely to be muscle gain this early on. I guessed that it could be down to all the additional water that she was drinking. I’d also read some articles describing how new exercisers can put on a little weight for the first week or so as their muscles hold on to fluid to help themselves repair. It’s only a little and it soon goes as your muscles get stronger. That all sounded sensible to us. I stood on the scales to see whether I’d similarly gained a couple of pounds. Ohhhh yes. And some! I’d gained 6lb. I stopped eating extra, made sure I ate lunch much later, and luckily the extra chub has sorted itself out. I didn’t cut down or (rinse your mouth out after saying it) diet. So as of today, weight-wise I’m back to where I started (11st 2. And whilst I’m recording stats, my waist is an unhealthy 33” but I’m not panicking because surely running will do something about that). More importantly than weight gain or loss, though, I’m feeling a bit stronger in my legs (regaining muscle and stamina are my main goals), and my general mood has definitely improved. I’m less likely to spiral into a hard to shift gloom. Can’t say my temper’s calmed down any, though, as The Boss can attribute (from inside his fallout shelter). The minxes have stopped giggling at me in my running clothes and take it as read that on Monday and Wednesday nights, Mummy goes out to have fun running. They actually paid attention when I explained why warm-ups take so long and feel so horrible, and why I want them to persevere on their Daily Mile at school. And actually, that’s the thing that my mind has really been chewing over this past week especially – what effect my running is having on the minxes. I thought going out 2 nights a week to run would be a bit of a general ‘good influence’ on the girls, and dismissed it as not being anything important. Now, though, as well as them quizzing me on how I could possibly be enjoying it so much, they’re offering up observations. Maxi said that I still shout as much, but the lead-up to the shouting is much longer. She asked whether running was making me more patient, or was it from me sleeping better? All 3 girls know I was the worst runner in my school (if not entire district) and are genuinely intrigued as to why I’m doing it, what I’m actually enjoying and how I’m managing to improve. They sat open-mouthed like baby birds when I described how I feel like I’m hurtling through space when I sprint, now (I know! Me! Sprint! Hahahahaha! It’s just when we did a little introduction to fartlek training and I discovered that I could run an awful lot faster than I thought I could. It was only over maybe 20m, so don’t get all excited…). There’s that Nike advert and hashtag, #thisgirlcan. I’d always huffed and thought, aye, not me! despite telling my 3 girls that of course they and all girls certainly could do anything they wanted. Well, between us, Mrs P and I are showing 5 impressionable little girls that even us old birds can! It’s never to late to give it a try and just do it (to use another hackneyed advertising phrase. Sorry). So: lots of introspective analysis going on in my little bubble this month, but it’s all good. Lastly, to keep us going and on track, Mrs P talked me into signing up for a 10k mud obstacle race in the autumn. I’m easily led. I’m also so frightened by the prospect that Endomondo has recorded my running pace pick up every time either of us spoke the words ‘Banchory’, ‘beast’ or ‘September’. I’m scared but also have a cunning plan. I’ll tell you about our plan to actually achieve this race without killing ourselves in the process in my next accountability post. That’s the end of Week 4 of me and my partner in crime, Mrs Persuasive, learning to run with our local JogScotland group. I’ve now completed 9 runs (and a replacement MuTu Intensive session at home today because 2/3 minxes are off school ill and I can’t go out). New things this fortnight: me and Mrs P went for our first run by ourselves last week because we want to up our sessions to 3 times a week. We happened to stumble on a wee circuit along single track country roads that is hilly and exactly 6km long. Perfect! 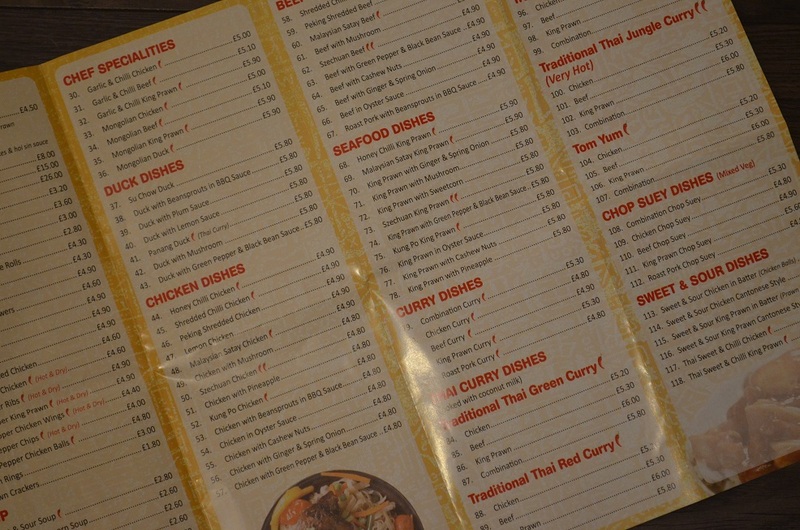 I’ve not been finding it hard to motivate myself to go running at all. Partly it’s because me and Mrs P car-share to get to the JogScotland group in a nearby town, so we’d need a cast-iron excuse to dodge going; partly it’s because I do love how good I feel at the end of each run. I’m sleeping better, too. Though that should be a no-brainer – the minxes need to be sufficiently active during the day to not transform into wide-awake devils that night, so it shouldn’t be a surprise that it works for insomniac adults, too. The other thing that’s motivating me enormously is seeing steady, obvious progress each run. It’s not just subjective improvement: once I figured out how to work Endomondo on my brick of a phone, I can see my speed and the length of time between walk-portions increase with each running session. I’m still only around the pace I can fast-walk, though: my latest personal best is upping my 5km jog/walk time to 46 minutes (4 mins faster than I walk it, and 10 minutes faster than a fortnight ago). It’s now 2 weeks since I started jogging with JogScotland, and I thought I’d start to write reasonably regular howgozit accountability posts. So, how’s it been going? Well, I’ve now been out jogging 5 times and (whisper) I’m really enjoying it. Remember I thought I’d hate it and be in bits? Well, I also thought each running session would only last around 20 minutes or so. I was wrong on all counts. The first session was just over an hour of walking / gentle jogging. Although I was a bit stiff the next day (hey, I’m 45, unfit and overweight! ), nothing actually hurt. Subsequent sessions have been just under an hour. This week I felt that there was a big jump in difficulty in terms of walking less and jogging for longer in one chunk. The first 3 sessions I felt a bit torn: on the one hand it was marvellous that I could keep up with all the other absolute beginners (a first for me), and that we were actively encouraged to keep on chatting and use the difficulty in maintaining a conversation as a guide to getting the effort right. Not a problem, I can do that! The group leader kept our speed slow and steady. But on the other hand, I felt a bit frustrated that I can walk our usual 5.5km route faster than we jog/walk it. Still, I trust the group leader. It’s a new and different way of doing things. And the old way I’ve always done things hasn’t worked up till now (go full tilt. If no success, beast self harder. If still no success, increase beasting until physical breakdown. If still no success, sulk and give up). 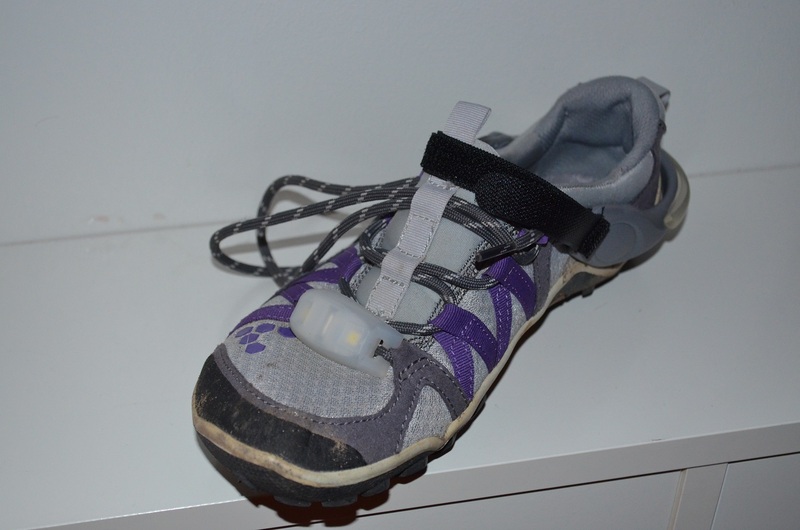 I worried a lot about my feet: despite being a beginner runner, I’ve chosen to run in barefoot-style shoes. I’ve been walking in them for 8 or 9 years to (successfully) strengthen very weak ankles that used to suffer sprains and twists every few months. I tried on a very old pair of old-fashioned wedge-heeled trainers I found at the back of the wardrobe (about 15 years old, but worn only twice). They felt awful, like I was wearing tight platform boots. But I’ve had to run often enough in the past to know that as well as running like an egg-whisk (think flappy knock-knees), I also have a very, very heavy heel strike. Bash-heel-then-flap-sole-down-splat. I can’t afford to splash out on new running shoes just now, even though I know that these and a good sports bra are the only running essentials all newbies need. Well, I got the sports bra in the M&S half-price sale (hooray!) and decided to wear my comfiest Vivobarefoots and just concentrate on placing my feet a bit more softly than usual. I was very bemused to discover that I must have got a free upgrade to ‘normal feet’ at some point in the past decade without me noticing: it feels that l pretty much land on the ball of my foot and push off on my toes. I don’t get sore feet (though sometimes the back of my toes ache a little). I certainly don’t get backache from jarring my heels on the pavement. This is amazing! So how are the old stats? Well, after 5 sessions I can jog/walk 5.5km in 55 minutes. It’s maybe 50/50 jogging and walking. The first 20 minutes feel horrible, then after 30 minutes I start to feel quite normal and even happy. The warm-down feels fantastic – I can’t get enough of the bend over and stretch your lower back stretch. It’s very early days yet, and the minxes are still giggling at the sight of their old ma heading out the door encased in tight leggings with a smile on her face, but so far so good.